As they near their 20th year as a band, Kinski show no signs of slowing down. They continue to push forward, seeking out new ways to blow your mind. Their new record, Accustomed to Your Face, sounds as free and daring as their early forays, but with the luster of confidence that comes with two decades of playing together. 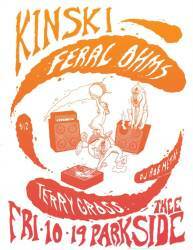 Having played arenas and festivals across North America and Europe, Kinski are equally at home in a local club where they can test out new material, looking to find that choice spot between pure sound exploration and off the hook riffage. One never knows what to expect when seeing Kinski live (there may be some flute, a bass played with a bow), but no matter where the music ventures it will always come back round to expertly crafted, rhythmically solid rock. Accustomed to Your Face reflects that multi-faceted approach. In the tracks "Guest Girl Vocalist" and "There Goes Hot Stamper", Kinski seem to have harnessed the power of early punk and wed it to their own tight and head-on approach to the genre. But then there is "Kinski 101," a celebratory nod to their quintessential style of dynamically structured instrumental pieces. Weaving it all together is Kinski's consistent command of their craft. The rhythm section is dialed in and the interplay between the guitars continues to be more than the sum of their parts. With deep roots in krautrock and South American rock of the 60's and 70's, Kinski have always been a proponent of like-minded groups from around the world, and have brought many bands to the U.S. including Acid Mothers Temple (Japan) and Träd, Gräs Och Stenar (Sweden). Similarly, their collaborations with artists such as the dance duo robbinschilds and installation artist Jim Hobbs have been fruitful, allowing them to further delve into regions of sound, working from different perspectives while connecting with new audiences that may have otherwise remained unaware of their work. (°2017, San Francisco) creates media artworks and conceptual artworks. Through a radically singular approach that is nevertheless inscribed in the contemporary debate, Terry Gross tries to create works in which the actual event still has to take place or just has ended: moments evocative of atmosphere and suspense that are not part of a narrative thread. The drama unfolds elsewhere while the build-up of tension is frozen to become the memory of an event that will never take place. Their media artworks are saturated with obviousness, mental inertia, clichés and bad jokes. They question the coerciveness that is derived from the more profound meaning and the superficial aesthetic appearance of a song. By putting the listener on the wrong track, they use references and ideas that are so integrated into the process of the composition of the work that they may escape those who do not take the time to explore how and why their songs may haunt you, like an undercooked pork chop, long after you’ve heard them.